Quercus agrifolia var. frutescens Engelm. Quercus agrifolia, the California live oak or coast live oak, is a highly variable, often shrubby evergreen oak tree, a type of live oak, native to the California Floristic Province. It grows west of the Sierra Nevada mountain range from Mendocino County, California, south to northern Baja California in Mexico. It is classified in the red oak section of oaks (Quercus sect. Lobatae). This species is commonly sympatric with canyon live oak (Q. chrysolepis), and the two may be hard to distinguish because their spinose leaves are superficially similar. Coast live oak typically has a much-branched trunk and reaches a mature height of 10–25 meters (33–82 ft). Some specimens may attain an age exceeding 250 years, with trunk diameters up to three or four meters (10 or 13 ft), such as those on the Filoli estate in San Mateo County. The trunk, particularly for older individuals, may be highly contorted, massive and gnarled. The crown is broadly rounded and dense, especially when aged 20 to 70 years; in later life the trunk and branches are more well defined and the leaf density lower. The leaves are dark green, oval, often convex in shape, 2–7 cm (0.79–2.76 in) long and 1–4 cm (0.39–1.57 in) broad; the leaf margin is spiny-toothed (spinose), with sharp thistly fibers that extend from the lateral leaf veins. The outer layers of leaves are designed for maximum solar absorption, containing two to three layers of photosynthetic cells. These outer leaves are deemed to be small in size to more efficiently re-radiate the heat gained from solar capture. Shaded leaves are generally broader and thinner, having only a single layer of photosynthetic cells. The convex leaf shape may be useful for interior leaves which depend on capturing reflected light scattered in random directions from the outer canopy. The flowers are produced in early-to-mid spring; the male flowers are pendulous catkins 5–10 cm (2.0–3.9 in) long, the female flowers inconspicuous, less than 0.5 cm (0.20 in) long, with 1–3 clustered together. The fruit is a slender reddish brown acorn 2–3.5 cm (0.79–1.38 in) long and 1–1.5 cm (0.39–0.59 in) broad, with the basal quarter enclosed in a cupule; unusually for a red oak, the acorns mature about 7–8 months after pollination (most red oak acorns take 18 months to mature). Quercus agrifolia var. agrifolia. Throughout the range of the species. Leaves that are glabrous to slightly hairy on the abaxial side, especially near the leaf vein axils. Hybrids with Q. kelloggii, Q. parvula var. shevei, and Q. wislizenii are known. Quercus agrifolia var. oxyadenia. Southwesternmost California (San Diego area), Baja California. Leaves that are tomentose abaxially, with densely interwoven hairs. It prefers granitic soils; hybrids with Q. kelloggii known. Several hybrids between coast live oak and other red oak species have been documented. Hybrids with interior live oak (Q. wislizenii) are known in many areas in northern California. Coast live oak also hybridizes with Shreve oak (Q. parvula var. shrevei). All these oak species show evidence of introgression with one another. The California oak moth (Phryganidia californica) caterpillar subsists entirely on living and fallen leaves of the Coast Live Oak. In 8–10 year cycles, the caterpillar will appear in sufficient abundance to denude healthy trees. The trees recover, and botanists speculate that the species provide mutual benefit, possibly in the form of fertilizer for the oak. The coast live oak is also the only known foodplant of Chionodes vanduzeei caterpillars. At least twelve distinct cultures of Native Americans are known to have consumed the acorns as a dietary staple. In the 18th century Spaniards in the San Fernando Valley used the wood for charcoal to fire kilns in making adobe. Later this form of charcoal would be utilized in the baking, gunpowder and electric power industries. In the 18th and 19th centuries shipbuilders sought out the odd angular branches to make special joints. Pioneers moving west would harvest small amounts for making farm implements and wagon wheels, but the greatest impact was the wholesale clearing of oak woodlands to erect sprawling cities such as San Diego and San Francisco. The irregular shape often let the tree escape widespread harvest for building timbers, and also led the early settlers to endow the coast live oak with mystical qualities. Its stateliness has made it a subject of historical landscape painters throughout California modern history since the mid-19th century. Coast live oak has also become a common addition to western USA landscaping. It is however sensitive to changes in grading and drainage; in particular, it is important to respect the root crown level and avoid adding soil near the trunk when construction or landscaping occurs. Also, if incorporating it into a landscaping scheme with artificial irrigation, it is important to avoid regular watering within the oak's drip line (canopy), since wet soil in the summer increases infection rates by soil-borne Phytophthora diseases like sudden oak death. The coast live oak, especially in its Spanish forms encino or encina, encinitas "little oaks", and encinal "oak grove", gave its name to seven land grants across California and to many communities and geographic features. These include Rancho Los Encinos, the Los Angeles community of Encino, Encinitas near San Diego, and Encinal del Temescal, now the city of Oakland. Paso Robles ('Pass of the Oaks') also refers to oaks as a geographical place name. ^ "Quercus agrifolia Née". World Checklist of Selected Plant Families (WCSP). Royal Botanic Gardens, Kew – via The Plant List. ^ "Quercus agrifolia". Natural Resources Conservation Service PLANTS Database. USDA. Retrieved 30 July 2015. ^ "Quercus agrifolia". Calflora: Information on California plants for education, research and conservation, with data contributed by public and private institutions and individuals, including the Consortium of California Herbaria. Berkeley, California: The Calflora Database – via www.calflora.org. ^ a b c d e f Nixon, Kevin C. (1997). 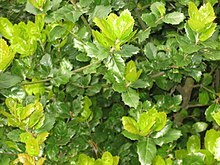 "Quercus agrifolia". In Flora of North America Editorial Committee (ed.). Flora of North America North of Mexico (FNA). 3. New York and Oxford – via eFloras.org, Missouri Botanical Garden, St. Louis, MO & Harvard University Herbaria, Cambridge, MA. ^ Née, Luis. Descripción de varias especies nuevas de 'Encina ' (Quercus de Linneo). Anales de historia natural. volume 3. 1801. ^ "Quercus (Oak) Notes – Trees of Stanford & Environs". trees.stanford.edu. ^ Moerman, Daniel (2010). Native American Food Plants: An Ethnobotanical Dictionary. Timber Press. pp. 472–473. ^ J. M. Davidson (7 July 2003). "Sudden Oak Death and Associated Diseases Caused by Phytophthora ramorum". Plant Management Network. Retrieved 12 January 2010. Wikimedia Commons has media related to Quercus agrifolia. Balls, E. K. (1972). Early Uses of California Plants. University of California Press, Berkeley. Pavlik, B. M., Muick, P., Johnson, S., & Popper, M. (1991). Oaks of California. Cachuma Press ISBN 0-9628505-1-9. Sawyer, John O., & Keeler-Wolf, Todd. (1995) A manual of California Vegetation. California Native Plant Society, page 241. "Quercus agrifolia". Native Plant Database. Lady Bird Johnson Wildflower Center, University of Texas at Austin. This page was last edited on 13 March 2019, at 00:01 (UTC).